In a dystopian America, the mega-corporation GeneCo provides organ transplants, in addition to cosmetic surgeries, on a payment plan, making them available to everyone. Widespread surgical addiction has led to an underground market for a powerful painkiller called Zydrate, which is harvested from the brains of corpses. GeneCo is also legally able to repossess defaulted organs. Clients who default on payments will be hunted down by Repomen: skilled assassins contracted by GeneCo to recover organs, usually killing the clients in the process. Shilo Wallace (Alexa Vega), a 17-year-old, believes she inherited a rare blood disease from her deceased mother. 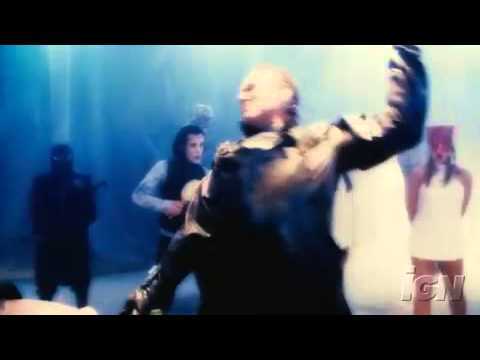 Her overprotective father, Nathan (Anthony Head), has kept Shilo locked away for most of her life, although she frequently slips away to visit her mother’s tomb. On one such visit, she runs into GraveRobber (Terrance Zdunich), who is digging up bodies to make Zydrate. They are discovered by Repomen and forced to flee. After passing out, Shilo wakes in her room with her father. 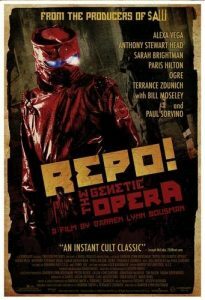 The CEO of GeneCo, Rottissimo “Rotti” Largo (Paul Sorvino), discovers that he is terminally ill. Rotti’s children, Luigi (Bill Moseley) and Pavi (Nivek Ogre), bicker over who will inherit GeneCo. In truth, Rotti (who killed Shilo’s mother for rejecting him and used it to bind Nathan to him as the Repo Man) wants to make Shilo the head of the company. Meanwhile, Rotti’s daughter Carmela “Amber Sweet” Largo (Paris Hilton) gloats that she will soon replace Blind Mag (Sarah Brightman), GeneCo’s star opera singer, who is on the verge of defaulting for her surgically enhanced eyes. If Mag retires from the Opera, GeneCo will repossess her eyes.